We have a new Project Summary screen with enhanced functionality that will allow you to analyze your projects at the project, task, people or time entry level. Timesheet’s menu is completely redesigned so that it takes fewer clicks to get to the screen you want. You can now drag and drop tasks to re-order them while creating or editing a project. Drag and drop the tasks by clicking on the 3 dots to the left of the tasks and moving the task up or down in the list. Filter by Project Status in the project list. 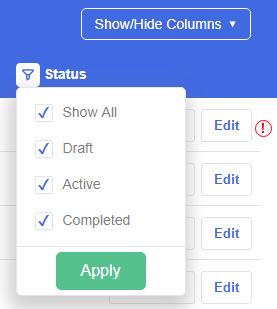 Click on the icon beside the Status title in the project list to pick the filters you want. 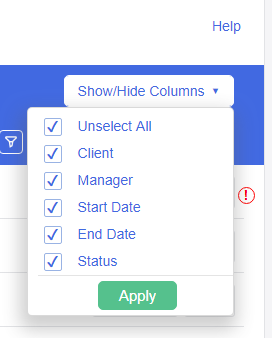 A button at the top-right of the Projects, Employees, Clients, Groups, and Task Templates will now let you hide columns in the list to remove information that is not important to you. You can now see who is assigned to tasks by hovering over the Assignee field in the task list when creating or editing a project. When creating or editing a project, the Save button will now stay grey until there are changes that need to be saved, then it will change to green. The Search bar has been redesigned to make it more intuitive to use. Added the project End Date column in the Projects screen. While creating or editing a project and adding a new client, the new client will automatically be set as the client for the project. Minor word and user interface changes were made to the project creation and edit screen to improve user experience. Improved the indenting and re-ordering of tasks in the project creation and edit screen. We have updated many of the messages throughout Timesheet to be more clear and easily understood. The login process is much quicker. Fixed a bug where custom fields, in some cases, were not shown after upgrading from a previous version of Timesheet. When saving a project with a start date after the end date, the check mark is no longer shown on the Save button after a save is completed. Fixed the issue for Safari web browser users where users would be logged out after submitting time. In some browsers, the Back Date for the Pay Rate in employee properties was not saving. This has been fixed for all browsers. Added a message to the Bulk Employee Update indicating that the action was successful after applying changes. A rare bug has been fixed where employee properties would not be saved and an error screen would be shown. This would only occur if the customer was using the Timesheet API. Fixed a bug in the Project Alerts screen where the Add New Alert button was misaligned. Added a border to the Import Reports screen. In certain scenarios, the billing overtime drop-down control in the Employee Properties screen was not working correctly. This has been fixed. Fixed multiple issues in the Leave Absences screen interface, including missing buttons. Bill by column will now show in the Assignment Billing Rate type in Reports. In rare cases, a subtask was not saved as a subtask. This has been fixed. When a task’s billable option is set to User Defined, the budgeted hours for that task are now included in Budgeted Client costs. 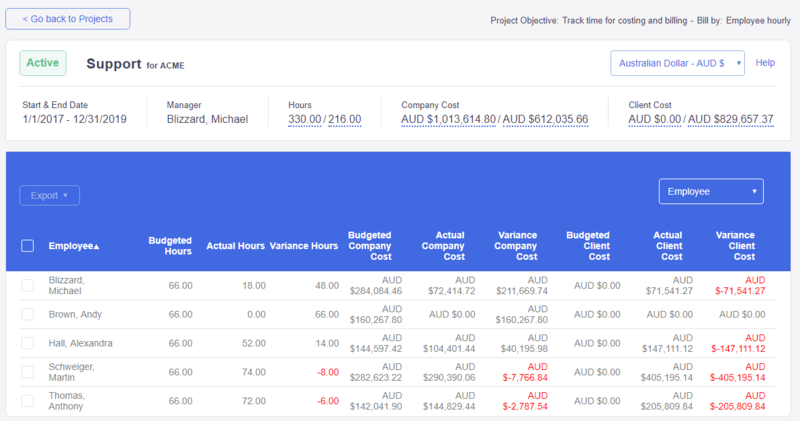 Made changes to how Budgeted Client costs are calculated depending on the how the billable option is set for a task in the project creation and edit screen. Custom Terminology will now be displayed correctly for project screens. Custom Terminology was not being used in some report titles. This has been fixed. Fixed overtime rate drop-down controls not closing properly on Employee Properties screen. No longer get an error clicking on the save button twice when entering a time entry in the Time Calendar view. If you have any questions please email support@dovico.com or call us at 800-618-8463 or for our international callers 00 800 4618 8463.